The licenses can be purchased and reviewed in GIS Cloud Manager. 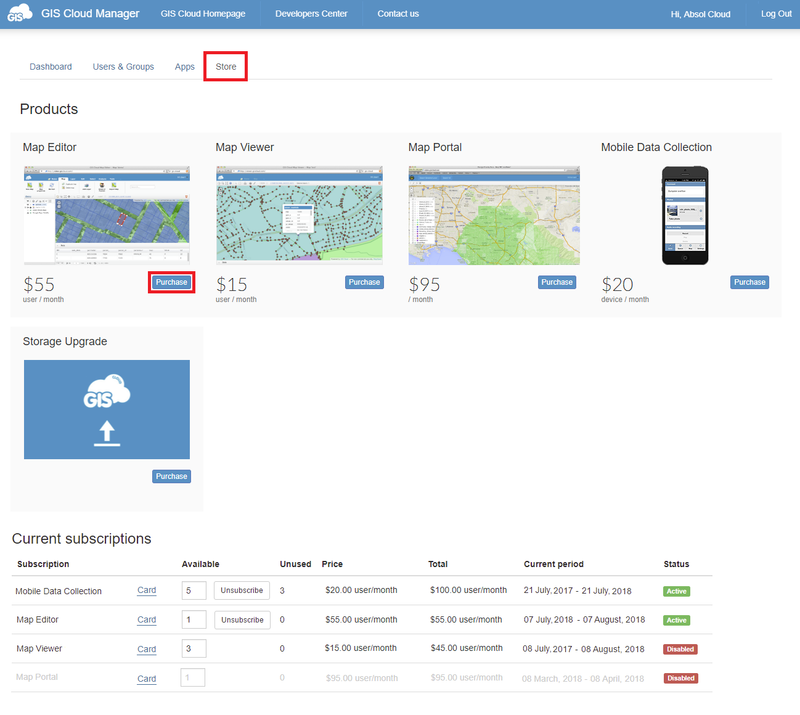 Open Manager app and login with your GIS Cloud credentials. Select one of the apps and choose a plan. Note: if you have a question regarding licenses or the plan, don’t hesitate to contact us at sales@giscloud.com. 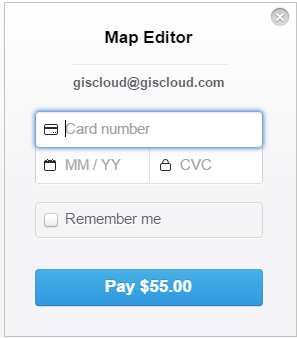 GIS Cloud uses Stripe for purchases. When the plan is selected, the Stripe dialog will open. Add the credit card information and Pay button. All subscriptions can be reviewed in Manager app, under the Store tab, on the bottom of the page. Important note: the purchased licenses have to be assigned to the users. More about assigning licenses can be found here. The list of all purchased licenses is on the bottom of the Store. Available – the number of the available licenses is written in the box. The unsubscribe option will stop charging the credit card. You will be able to use the license until the end date. Status – The licenses can have two statuses: Active and Disabled. Active subscriptions will be charged again upon the end date, and disabled (unsubscribed) licenses won’t charged again. The expired subscriptions are greyed.